I can never decide if I’m a fudge style or cake style brownie kind of girl so this brownie is the best of both worlds. The outside edges are chewy and cake like and the center sets fudge like. It’s easiest to cut it after it’s been refrigerated for awhile so try to resist digging into them when it’s straight out of the oven. Treat the baking time as a guide because if you use a different size tin or your oven temperature isn’t right, it’ll change how long it takes to bake. It’s a fine line between raw brownie goop in the middle and fudgey-ness so tread carefully! This recipe is part of a collection of recipes I’m creating for the Barker’s Pantry website. It uses the Barker’s New Zealand Mixed Berry Compote to create a swirl pattern in the cream cheese batter just before you bake the brownies. The compote adds a bit of sweetness and tartness to each bite. This is perfect as a dessert or for afternoon tea. Melt butter in a large saucepan over low heat. Remove the saucepan off the heat and add the chocolate. Let it sit for 2 minutes before whisking everything together. Add in the sugars and whisk everything again –it’s normal for it to look grainy. Set the saucepan aside for 15 minutes to allow to cool slightly. During this time, place the cream cheese into the stand mixer bowl and whisk for 1-2 minutes. Add the egg and ¼ cup of caster sugar and beat everything together for a few minutes till smooth. In a small bowl, mix together the flour, salt and cocoa powder. Set aside. Whisk in one egg at a time into the chocolate batter until all 4 eggs are well incorporated. Whisk in the vanilla extract and olive oil. Add the dry ingredients into the saucepan and whisk everything together. Make sure you really mix everything in so that the batter doesn’t split during baking. Pour the chocolate batter into the square tin. Spoon the cream cheese batter top and dollop spoonfuls of Barker’s Mixed Berry compote around the tin. Using a knife or fork, drag it through the cream cheese mix to create swirls with the compote. Place on the middle oven and bake for approximately 1 hour and 5 minutes or till the center is just set when the tin is gently shaken. Start checking the brownie after the 50 minute mark to make sure the top is not browning too much. If it is browning, lightly cover the tin with a piece of aluminum foil. From the 50 minute mark, start checking every 5-10 minutes depending on how wobbly the centre is. Remove the tin from the oven and allow the brownie to completely cool before attempting to slice it. It’s actually best if you rest it in the fridge for at least a few hours. 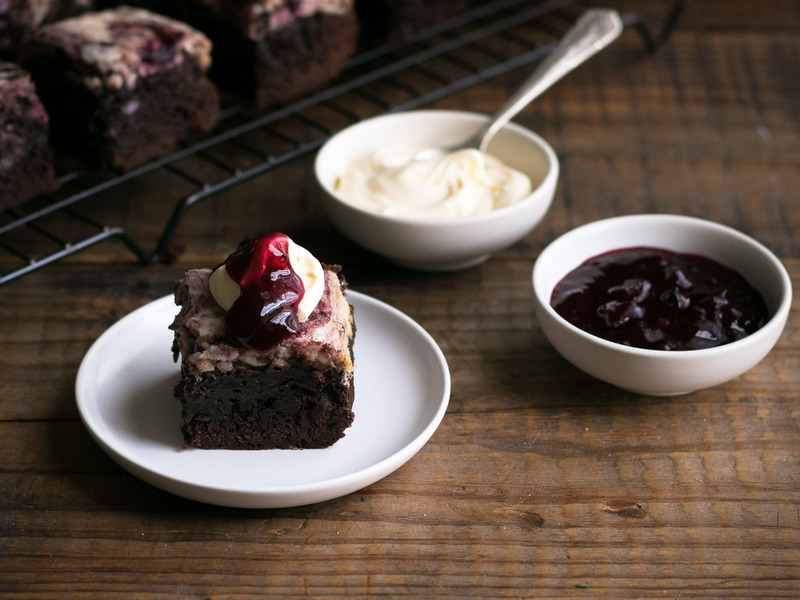 Serve slices of brownie topped with cream and extra compote.